So if I understand correctly, more money to songwriters, and Apple is supporting this. Good! Apple is getting portrayed favourably as a friend to the arts by not appealing the increase. Apple makes more money than the difference in royalties. Good for Apple for doing the right decent thing in supporting artists. The other streaming companies are shameless and beneath contempt. OMG! The horror of songwriters being able to live off their craft! Amazon and the rest probably think the songwriters should drive Ubers to make ends meet. In other news, Apple being investigated by FTC for supporting a business model that "may" increase the price to consumers. Forgot "Enter Amazon" against Apple for paying writers. Props for picking up my point. Increasing price for consumer isn't bad when it compensates the creator. 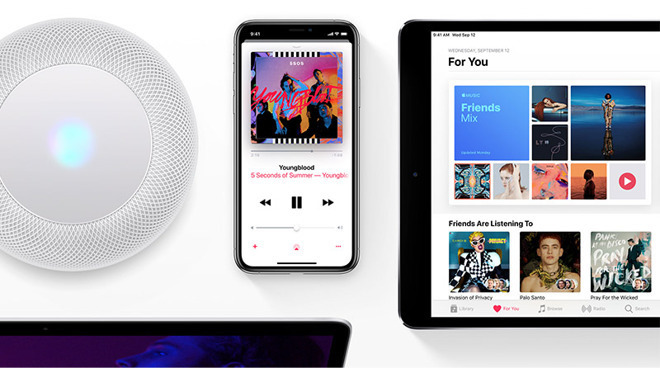 In the short term, this will hurt Apple’s Services revenue, and users may need to expect a modest price increase across all the music-streaming services to cover the increased costs of the material that forms the core of these services. I think we’re looking at $12 a month rather than the present $10/month level, but I don’t think this will happen for another couple of years. In the medium-term, artists telling their fans to use Apple Music rather than the others because of their opposition to actually paying songwriters fairly will prove to have been a big mistake by Apple’s streaming rivals. Long term, once this is settled equilibrium will set in and the services will be roughly equal again. One cynical view of this is that Apple doesn't really care if it loses money (or even more money) on Apple Music right now... it can afford it while its competitors (especially Spotify!) can't. Spotify just _barely_ started making a profit... if the royalties go up... the Spotify will have to raise prices. Apple, however, doesn't need to raise prices because it can afford to take a loss on Music and make money on everything else (iPhones, etc.). If Spotify has to raise prices and Apple Music doesn't... we could see a huge shift in people leaving Spotify for Apple Music... which will further damage Spotify. Yes, yes... Google and Amazon still exist at that point (they can afford it too)... but with much inferior products and a much smaller userbase they hardly matter. Anyway: my point is... Don't always ascribe altruism to a company's actions. There are _many_ reasons why a company does what it does... and most of the time it has to do with profit (either now or in the future). You do make a good point IMO. Apple can afford to just go with the flow knowing it can afford to take a loss on Apple Music because it has other hardware, software and services to make up for it whereas their biggest competitor Spotify has nothing to recoup its losses other than more subscribers which it may find harder to get if it has to increase its prices because of the royalty fee increase. This is Apple actually playing hardball with its competitors which yes, in the end benefits the artists as well. Good points, but I feel like if that was Apple’s intention they could just lower their prices now to achieve the same goal (if the goal is to damage Spotify). The biggest problem with Spotify is their free tier that is unprofitable for everyone involved. Honestly - I'm surprised they don't do it now. I think they're honestly ok with slowly growing their userbase while they work out the kinks... and they'll come on more aggressively in the near future. Well it's true, there is seldom anything altruistic in business. The problem is Spotify expecting the artists to take a hit so that it can make a profit. If it cannot make a profit, it should quit. It can't say "I'll distribute your content and make money, but you, as the creator of the content shouldn't expect much." How is Apple a greedy company when they want to pay to artist more, while others want to pay less? How easy it is to compete and play the good-guy with massive cross-subsidizing. They could always have "paid the artists more" anytime they wanted to, that's what Tidal originally intended, altho this is NOT what the new Copyright Board ruling addresses anyway. This is for the songWRITERS and not the performing artist, tho on occasion they may be one and the same. ...and yes Apple will garner some good PR with the performers by not opposing this increase for the writers. Smart to let others complain, there's plenty of others to deal with the business/legal stuff, keep Apple out if it. Yes. So what do we learn from this? Doing the right thing actually wins in the end. Every time. This is why Apple succeeds. And be accused of "unfair business practices" by FTC and others, the way Amazon was when they started lowering prices to beat the competition? This way is easier and less prone to such accusations.